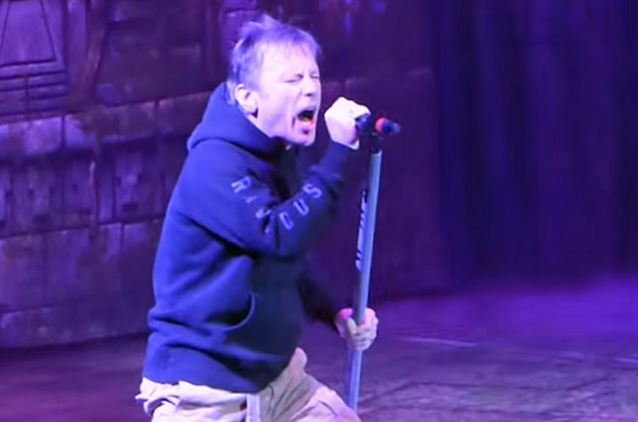 Fan-filmed video footage of IRON MAIDEN's March 30 concert at Madison Square Garden in New York City can be seen below. 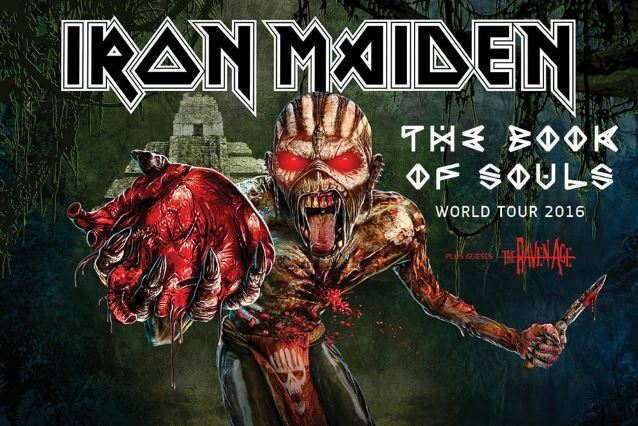 IRON MAIDEN's world tour, in support of the band's latest album, "The Book Of Souls", kicked off on February 24 in Sunrise, Florida (a suburb of Fort Lauderdale). IRON MAIDEN bassist Steve Harris recently told Argentina's Vorterix radio about whether singer Bruce Dickinson's cancer battle made him think about a possible end to MAIDEN: "Yeah, I mean, I think at this stage of our career, I really don't think we would have looked to another singer, that's for sure. We didn't even consider it. I mean, there's no point. We can't really replace Bruce anyway, so we wouldn't try at this stage in our career, I don't think so. But, thank God, we didn't need to, and he's fine. The main thing is that he's okay, and he is okay. But the second thing is, obviously, now we can tour and we can make albums, and I'm sure he's gonna be fine in the future. So, you know, he seems really well, and he's singing well, so… Thank God that we are still together." Asked whether he has ever imagined his life without IRON MAIDEN, Steve said: "Well, you know, you have to… I think you have to kind of get your head used to the fact that some day it's gonna happen. I mean, it took me a long while to realize that I wasn't gonna play football on a regular basis anymore. I still play once in a while, but that took me a long while to adjust. And I think, obviously, with the band, it's gonna be even worse, so I'm not looking forward to that. But, you know, you just have and try and focus and do other things, so you have your mind on something else." Regarding what the key is to keeping the band together seventeen years after Bruce Dickinson and Adrian Smith rejoined IRON MAIDEN, Steve said: "I think everybody's grown up. I think everyone's matured and we don't argue about stupid things anymore. Not that we used to argue that much anyway — we didn't really argue that much — but I think when you're younger, sometimes trivial things, you know, they just get to you. And I think, as you get older, you get more experience and [become] hopefully a bit wiser, and you don't really make a big deal out of silly things."